Brooks Launch 5 are neutral performance running shoes. It took several years to renew the original Brooks Launch but every year within last four Brooks has released a new edition including current Launch 5 trying to gain some market share from (at least in Europe) absolute leader Adidas Adizero Boston 6. 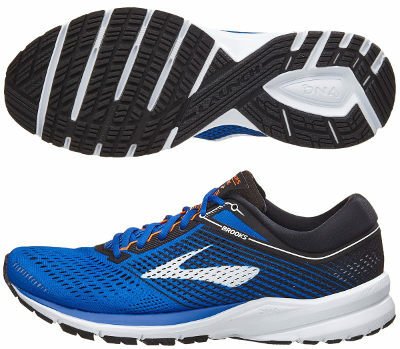 A little bit wider than competitors and featuring classical 10 mm drop, the Brooks Launch 5 is a great option for tempo workouts and racing road distances up to marathon. Major change compared to its predecessor Launch 4 takes place in revamped and cleaner upper where lighweight mesh plays main role and different overlays have been removed. Bootie construction provides maximum comfort and prevents chaffing. In a similar way as its bigger sibling Ghost 10 does, well padded and extremely comfortable interior and collar lining would be highly appreciated by brand loyal runners. Despite some complains about lackof grip on wet road, rest of Launch 5 remains the same while most robust rubber (HPR+) in more exposed areas gets most compliments. BioMoGo DNA foam performs well in midsole featuring smooth transition and comfortable cushioning while impressive grooves in outsole provide good flexibility and promote quick toe-off.